← Hearing Aids in the Compost Bucket? I’ve known the Unitarian Church in Salt Lake was one of the few venues looped for at least a year or so now. I kept meaning to go and test it but just found the time today. I went to test the loop mainly but I liked the service and people so I’ll go again. Those two signs together are so welcoming! 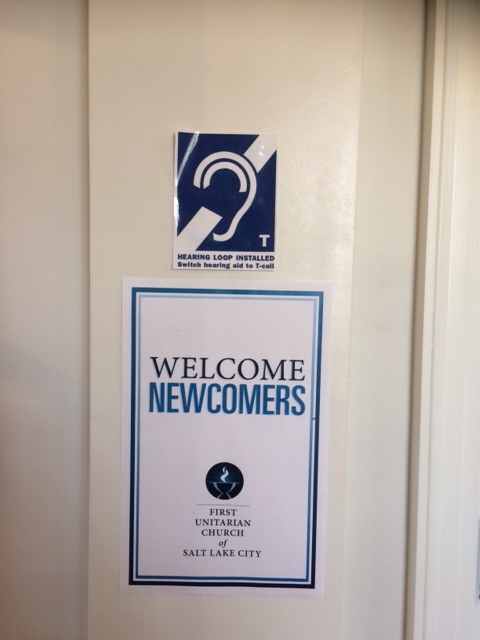 It’s nice that they have included those with hearing loss into their congregation. When the service started I tuned in with my t-coil program. I heard a bowl struck, a high-pitched ‘ting’, giving me an instant thrill because I could hear it. Next was a piano intro, a beautiful piece and the high notes were richer through the loop. Next came the choir accompanied by the piano and I was lost. It sounded good but the piano overshadows words so it’s hard to understand lyrics. I locked onto certain mouths trying to lipread. I could find words here and there but nothing to make sense of the song. It was interesting to note that some people really over exaggerate their words/mouth while singing and others stay more more normal. Hanging notes make it hard to lipread no matter what. The opening came next and every word came through the loop and into my ears. It’s always a thrill for me to go somewhere looped and hear words without having to lipread, without extreme concentration and fatigue. Word flowed into my ears, words like chalice which I’ve never heard spoken out loud before. For the first time today, I learned how to pronounce it properly. I’ve been saying it in my head wrong all these years! Then came a hymn. When they announced the hymn number, I had been taking notes so my head was elsewhere. I stood up with everyone, without taking up the hymn book and tried lipreading again without much luck. A short, guided mediation came next. For a many, many years I’ve had to keep my eyes open for prayers/meditations to lipread and this time I didn’t have to look understanding every word. It involved following the breath, big inhales and exhales…right in my ears. It was like someone blowing in my ear without the physical effect which cracked me up. Does everyone hear that and I never knew? It was hard to concentrate at first but soon I was deep breathing too. More singing and with me realizing although music sounds better, I’ll probably never really pick up on lyrics again. As they passed the offering bowl around, someone in the pew in front of me tried talking to me, probably wanted to say hi and welcome. I was in t-coil mode and didn’t know what to expect next in the servcie so I told her I couldn’t hear her and to wait while pointing at my ear. My hair happened to be pulled up and back so my red ear molds were clearly visible. She saw them and nodded. Just after that, the minister came to welcome me personally and I had a chance to tell him him how much I appreciated the hearing loop. He asked how it was working and I said it was great and told him for the first time I could follow a guided meditation without watching him. He did a little fist pump in the air. I told him I worked at the state Deaf and Hard of Hearing center and told him I’d be happy to talk more about the loop and give them more information. He took one of my cards and hopefully we will be in touch. He went back up front and started to read from a book. Usually when someone quotes straight from a book I have a hard time following along. Voices tend to go flat without rhythm and tone but this guy was pretty good. He read slow enough there were pauses and because he read it so much (he confessed) there was the typical rise and fall of speech. More singing and this time I noticed the hymn number was on the handout they gave us. I picked up the hymn book, found the page and tried to follow along…and failed. It didn’t even matter that I had the book and words in front of me. I lost my place because of the hanging notes. I put the book down and appreciated the sound of voices and music. I should note the choir didn’t have a mic so maybe that’s what made it so tough. The sermon was next which I followed easily still. I realized I didn’t have the concentration face at all, no furrowed brow and squinty eyes. No fatigue either. I even picked up on something he said wrong. He meant to say Facebook but he said Fakebook. I got to laugh in time with everyone else. It’s not very often I can tell a c from k sound. So she asked me about the t-coil, I explained the loop and how my hearing aids pick sound up. Her response was, “I need something like that so I can focus more too.” Ha ha. Everyone was invited into another room to mingle and I would have but I was starving! I only ate an apple before leaving the house. I started a new diet last Wednesday that doesn’t include, dairy, sugar, and processed food so I didn’t dare go into a room with all that handy while that hungry. I’ll go again because listening was effortless and hang out afterward, I will make sure I have a better breakfast next time too. This entry was posted in hearing loop and tagged hearing loops for clarity of speech, hearing loops in churches, hearing loops make a big difference, salt lake city hearing loop. Bookmark the permalink.